This article submitted by Linda Stelling on 9/27/00. Despite the chilling 40-degree temperatures, more than 60 students met to commemorate "See You at the Pole" at the Paynesville Area High School Wednesday morning. This is the fifth year Paynesville students have taken part in the national rally. The first "See You at the Pole" was held in early 1990 in Texas by a small group of students who attended a retreat. These students then wanted to spread the word of God. Not knowing where to go, they went to the flagpole at their schools and prayed for their friends, schools, and leaders. Pictured at right is Barry Christianson who led the group in singing. Beside him are Bonnie Davis and Tammy Christianson. The challenge was named "See You at the Pole." By June 1990, 20,000 students attended the rally at Reunion Arena in Dallas, Texas. On Sept. 12, 1990, more than 45,000 teenagers met at school flagpoles in four different states. Then, in 1991, more than one million students gathered at school flagpoles across the country to pray. This year a rally was held at the Crystal Hills Assembly on Sunday, Sept. 17, to kick off "See You at the Pole" for teenagers from area churches. On that brisk Wednesday morning, some of the Paynesville teens arrived wearing shorts while others donned their sweat shirts or winter coats to be with their friends at the flag pole. As students arrived at school, the circle around the flagpole grew. Youth leaders from area churches had hot chocolate ready for those participating. 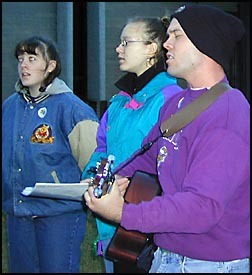 Barry Christianson led the group in singing songs while Sarah Brauchler and Shane Schmidt read scriptures. The students then broke into smaller groups to pray. Brauchler and Schmidt, who helped organize the gathering, were happy with the turnout. More than 60 students attended, the most ever for Paynesville. "We gather to pray for school. As others come to school, they ask us why and we help lead them to Christ," Brauchler said. Schmidt said the gathering shows what the students stand for as Christians. "It is a good time to pray for your school, state, elections, and whatever is on your mind," Schmidt said. The students attending all came for their own personal reasons, but for the same purpose, their love of God. Sophomore Chris Kern felt it was important to attend. "Once a year people get together to pray for their school," Kern said. "It's powerful!" Senior Ginni Lahr said praying is important, especially for teachers and nonbelievers. Trisha Chevalier and Mark Braun took part to praise the Lord. Braun said he was there because he loved God and Jesus loves him. Laura Stoneburner and Jessi Andrie attended because they felt it was a good way to communicate with other Christians.